Hull length: 2.9 m Hull width: 1.5 m Draught: 0.12 / 0.8 m Sail area: 5 sq. m Mass of hull: 55 kg Crew: 2 persons / max 200 kg Designer: Marek Jankowski M. Eng. 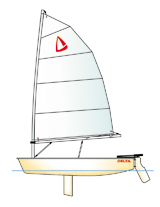 The Delta is a general-purpose sailboat. She has been designed and manufactured to allow everybody to sail regardless of his sailing experience. This designer's mission has been achieved thanks to single sail layout and very simple rigging. The freestanding shroud-less mast does not have a stay and for better transportation the mast is divided into two sections. When not used as a sailboat the Delta may be both an oar boat and motor boat with her centreboard pulled out and installed as a bench seat. The Delta is fast, manoeuvrable and very safe. We firmly believe that thanks to her you will live your water-based adventure and know the charm of sailing. suitable hull shape and the deck transom built up highly cause that the boat does not "take water"
We sell complete boats ready to sail, fully equipped with the sails, hardware and ropes including mooring rope. The Delta hull is made of glass-polyester composite. High strengthened deck construction is honeycomb type which gives suitable rigid. The anti-skid panels are manufactured separately and they may be colorized according to the client's order. The mast and boom are made of anodized duraluminum and the sail material is Dacron. Basic color of the Delta is white. For extra charge the company manufactures the hull, deck and anti-skid panels in the other colors. The colors palette available here. Other RAL standard-based colors are available as well for additional charge.